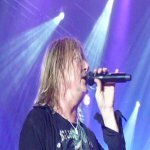 Def Leppard singer Joe Elliott has been interviewed by The Quietus as part of the current VIVA! Hysteria promo. Joe talked about the Down 'N' Outz second album recording, old Hysteria tour setlists, the Hysteria album's success, the Women video comic and playing old songs in Vegas. Joe also strongly hinted that 'Pyromania' would be the main featured album in any second residency. And interestingly mentions 'Slang' and 'X' alongside 'High 'n' Dry' as a second album they might play together with Pyro. Second Residency With Pyromania Album? "Not specifically. We've been talking a lot that if we were to go back to Vegas - and I do believe they're gonna ask us - we probably wouldn’t repeat Hysteria unless there was a huge demand to do so. Pyromania comes in at 42 minutes, so it's not really long enough to feature as a one album show. I think we'd end up having to do two albums, taking a break in between. High N Dry and Pyromania, or Slang and Pyromania, or X and… We'll worry about that when the offer comes in and whatever I say now will be outta date next year. So just take it for granted that possibly Pyromania but how we would dress round it either side, I don't know."